SÃO PAULO, BRAZIL – With the dwindling economy and the popularization of online communication Brazil’s Correios (Postal Service) has been losing customers. To try to increase revenues and reduce expenditures the state-owned company announced this week it will adopt several measures including no longer opening most of its agencies on Saturdays. The measure will begin next Saturday, March 19th. Correios’ President Giovanni Queiroz announces measures to balance accounts in 2016, photo by Valter Campanato/Agência Brasil. 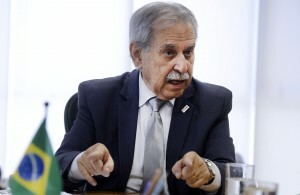 Queiroz noted however that agencies with a large flow of customers on Saturdays, such as those in airports and bus stations would remain open six days per week. Although the Post Office’s final balance for 2015 has not yet been calculated, officials predict a deficit of approximately R$2 billion. In addition to closing the majority of agencies on Saturdays, the post office plans to reduce the volume of overtime and nighttime paid to its employees, reduce sponsorships and advertising as well as revise administrative protocols. With these measures Queiroz hopes to save R$1.6 billion. To increase revenues the state-owned entity will start to offer virtual mobile services becoming a Mobile Virtual Network Operator and selling the mobile telephone chip with the Correios brand. Already the one of the official logistic operator for this year’s Rio 2016 Olympic and Paralympic games, the Corrios is also working towards becoming the main official logistics operator for the federal government, distributing educational books to public schools and prescription drugs to health clinics and hospitals. The entity also plans to increase its presence in the consortium segment, selling vehicle and real estate consortiums throughout the country.